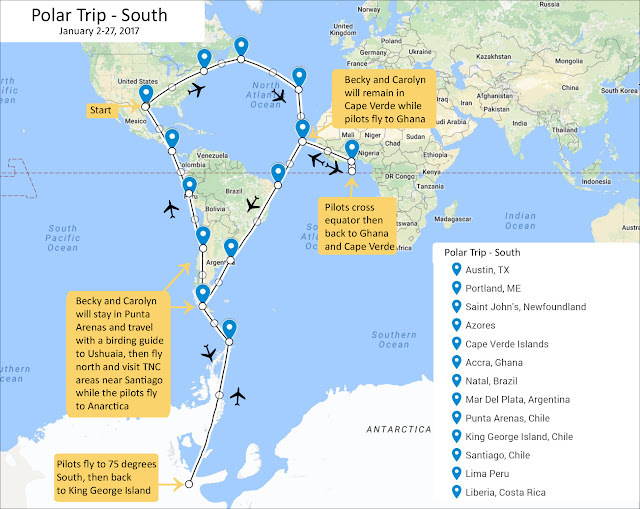 Today we started the southern half of our polar round-the-world (RTW) trip. We completed the northern half in August 2016 and, by comparison, it was simple compared to the southern route. Most significantly, we must fly to Antarctica in order to meet the FAI requirements for a polar RTW flight (see the first post in this blog for details). Our southern route will take us north to Canada, then south to Africa via the Azores. One of the FAI requirements is to cross the equator at at two points at least 90 degrees apart and thus we will accomplish the easternmost equatorial crossing near Ghana. Then we will cross the Atlantic (again) to Brazil and continue south to Antarctica. After crossing 75 degrees south latitude (another FAI requirement) over Antarctica, we will return home via the west coast of South America making our westernmost equatorial crossing to complete the four FAI required control points. Today started and ended with some weather challenges. We had planned to be "wheels-up" from Austin (KAUS), our home base, by 0515 local time (LCL). Well, the weather gods did not cooperate as a line of rare wintertime thunderstorms were crossing the airport almost exactly at out planned departure time. The weather radar with our originally planned route to the east looked pretty ugly. While we were anxious to depart, safety always takes priority and we waited. And waited. The flight crew (Josh, Jack, and Giuseppe) waiting at the Austin FBO for the weather to clear. Finally, about two hours after our scheduled departure the storms had passed a safe distance from the airport and we departed into clear skies and smooth air. However, our originally planned route to the east (our first stop of the day was Portland, Maine) was completely blocked by this solid line of storms with tops over 40,000 feet. So, we needed to make a big detour and turned west and then north toward Tulsa, Oklahoma before turning east to Portland. The distance of this very indirect route was 1,719 NM, but with very nice tailwinds that was well within the non-stop capability of the mighty Pilatus. We also were able to turn the corner earlier than planned which saved some time, thus the flight took a reasonable (given the distance) 5+30. Weather at cruise along revised route was clear with only a few minutes of light bumps as we turned the corner around the storm system. Along the way we heard an interesting conversation between and American Airlines jet and air traffic control (ATC). The American Airlines pilot reported they had lost the capability to use both of their flight management systems (FMS) and moving maps. The plane has redundant FMS systems, so pretty unusual to lose the ability to use both of them. They were back to "raw data" like everyone flew 30-40 years ago. It was not a big problem, but a reminder for us modern pilots to not get too dependent on fancy technology and always be proficient in going back to "old school" flying when required. The weather at Portland (KPWM) was beautiful and the approach and landing was east. We picked-up our last team member (Becky), did a quick-turn re-fueling, and were on our way to St. John's, Canada in about 40 minutes. The enroute weather to St. John's was beautiful...clear skies and no bumps. The same could not be said for the weather at St. John's. As we descending for the approach (now after dark) into St. John's, the weather report was low clouds, low visibility, snow, and high winds. Some of the airport taxiways were covered in snow and ice although the runway was basically clear. We executed the RNAV GPS approach to runway 34 which was straight-forward. Turns out the weather was not as bad as reported and we had the runway in sight about five miles away. But, it was bumpy and until we exited the cloud there was snow and some very light ice accumulation on the airplane which the deice systems cleared quickly. Once we landed, taxiing to the FBO was one of the biggest challenges of the day. With ice and snow covering the taxiways, we moved very slowly and made gentle turns. Even with that care, I felt the plane slip a couple of times. Fortunately, our plane has reverse thrust capability which helps in slippery conditions and things never got scary. Once parked, we unloaded and refueled before heading to a hotel just across the street from the airport. It was a cold, windy, and snowing as we got unpacked and our bird buttoned-up for the night. After a quick meal at a nearby restaurant, we were at the hotel and to bed early. However, given our later than planned arrival, we delayed our departure the next morning a bit to assure adequate crew rest. As I went to sleep, the winds outside our hotel were howling and sounded like hurricane force (they were not that strong in reality). I got ear plugs in order to get to sleep, but still dreamed of the winds pushing N575PC across the icy ramp at St. John's and into something solid resulting in bent metal which would have scuttled our whole trip on the first day. So, the good pilots waited and rerouted and we were wheels up on the way to Portland, Maine by 7:30. Inflight breakfast was served and enjoyed by passengers and crew. Once in Portland, we grabbed Becky, refueled, and visited the "necessary room" before heading to St. John's, Newfoundland. St. John's isn't particularly busy this time of year...the FBO said we were the first flight they'd had in a week. Beautiful, but very snowy, we had a wine and dinner at "Milestones" and comfortable accommodations at the airport Holiday Inn. It didn't snow overnight but the winds managed to blow snow and ice onto the wings, so N575PC was de-iced before departing at 10:30. And, just in case several thousands of dollars worth of avionics on the flight deck fail, we have a backup map. "You are here!" It was a smooth flight and Captain Jack nailed a crosswind landing, crabbing into Santa Maria, Azores, before another storm let loose. Jack will get caught up with his flying blog entries in the next few days. Headed for Cape Verde tomorrow (January 4) and then we will take a break from flying there for a few days.